Combat in Alyria is the rule, not the exception. Many dangerous and tricky creatures inhabit the lands, and an Adventurer must be prepared to face them. Melee combat occurs in a series of rounds. A round is when attacks and blows are exchanged between opposing forces. Combat is started when one side utilizes the ATTACK command or uses a special attack on an opponent. During combat, damage is inflicted in two overall ways. The first way is a series of hits from your WIELDed weapon, or if no weapon is being wielded, by your fists (also known as hand-to-hand combat. The hits will occur automatically once combat is started, and will not stop until someone FLEEs from combat, an opponent is incapacitated, combat is stopped through other means (for example, a calm spell, momentary darkness spell, etc.) or when there are no opponents left on one (or either) side. The second way is from using a "special attack". These can be magical spells, items that are THROWn at the target, or special rebounding defenses such as fireshield or reflect-magic shields. Using special attacks during combat will usually result in the number of hits you can issue per round being diminished, depending on how busy you are preparing the special attack. The amount of damage done to the opposing participant is dependent on the type of attack, the level of the attacker, their skill in using the weapon type, spell, or other special attack, and other attributes such as agility and strength. Each body part has its own armor resistance, which is a way of measuring how much damage you can absorb if a hit successfully connects with that body part. Each of these armor resistance types will have a value from 0 to 75, where 0 means that there is no resistance to attacks of that type, on through 75, which means that the maximum resistance to attacks of that type is present. 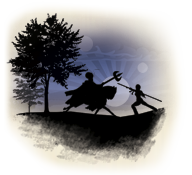 Armor resistance can be increased through items designed to protect the specific body part (a helm for the head, for example), and it can also be increased through the use of magic spells or enchanted items. Each body part has its own damage multiplier - meaning that if a hit lands there, the damage from the hit is either increased or reduced based on the body part. For instance, a blow to the head would do more damage to a humanoid than a blow to the leg. Unlike armor resistance, which reduces the damage caused by hits, combat defenses can cause a hit during an attack to be avoided entirely. A defense must be active in order to be used during a combat round. Active defenses can be changed using the COMBAT DEFENSE command. There are additional ways to block attacks - special equipment, magical spells such as telekinetic shield, combat blink and so forth. 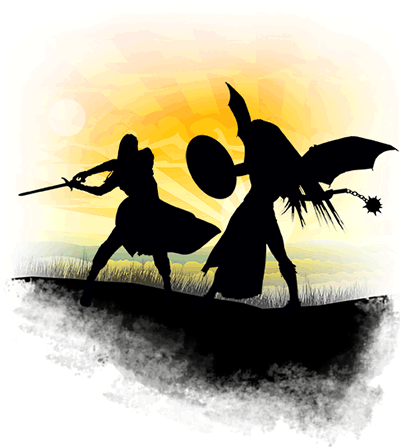 Within Alyria some adventurers have chosen to fight amongst each other in mortal combat. Special areas and zones have been marked off as acceptable places to do battle with other adventurers, but this sort of combat is governed by certain rules. If you enter a player killing area, it is assumed that you have accepted the risks and understand the rules involved. Playerkilling zones may be found scattered all over the world. Your corpse and some of your possessions will remain in the place in which you were slain, and can be looted by anyone. While journeying through these areas, you can be robbed by other players. CPK is restricted to players level 45 and higher. You will keep your possessions, merely turning into a ghost. Your slayer will not gain any experience from the fight. NPK is restricted to players level 25 and higher. You will keep all your possessions and will reincarnate instantly, but must regain hit points and other attributes before you can fight again. This type of room is most commonly found in Arena combat areas. Before entering combat with an unknown foe, it is always wise to CONSIDER the opponent first. This will tell you what you (potentially) may face in terms of difficulty. You will also want to LOOK at the opponent, which will provide you with valuable information, such as if he's in a formation of other NPCs (or PCs). The description you see when looking at someone may also tell you that he is someone you may not want to mess with. If your opponent is in a formation when you enter combat, and his formation members are in the room with him, it is very likely that they will join combat the round after the first attack is initiated. Beware that the single creature who looks so defenseless may be formed with some very powerful friends! If you are a spellcaster, take the time before combat to MEMORIZE your spells as needed. You can also apply any defensive spells to yourself (such as Armor or Bless), and possibly a few offensive spells to your opponent (such as Weaken, Faerie Fire, or Curse). Depending on the spells used, you can gain a nice bonus to your combat rounds, as well as weakening your opponent's blows. You can start combat rounds by ATTACKing your opponent. Combat can also be initiated by casting an offensive spell such as Spark or Shocking Grasp. If you are a Fey, you may FEED upon your opponent. Thieves can sneak up on a target and BACKSTAB them. You may choose to BASH or KICK, if you have the knowledge to do so. THROW is an additional option for Monks, Rogues, and Rangers. If you are of the Dracon race, you may make use of the BREATHE command. Dracons may breathe fire, acid, frost, gas, or lightning. Lightning and acid will hit only one victim at a time. Fire, frost and gas are area attacks and may hit other creatures in the same location and melee. Dracons gain the ability to use these individual breath attacks one at a time as they raise in experience levels. To leave combat, you may FLEE. If you would like to attempt to automatically flee once your hit points fall below a certain number, you may wish to make use of the WIMPY command. Combat may also be stopped through use of the calm spell, momentary darkness spell, or other magical intervention. Most likely you will die at some point during your adventures. When your hit points drop to zero and death inevitably occurs, the most important thing is to remember not to panic. In the world of Alyria, death for Adventurers follows different rules than you might otherwise expect, due to the intervention of the Powers. If you are under level six, the Powers usually take pity on you and restore you immediately to life, with all your equipment and inventory on you, without penalty. You'll have to rest a bit to rejuvenate your hit points, stamina, and spell power any time you are restored to life. You'll often be restored to the nearest RECALL point to where you were slain. If you are under level six and die in Lasler, for example, you will be restored in the Shrine of St. Wisehart. If you die in or near the Towne of Rune, you will be restored in the white-marble covered walls of the Runic Temple. At level six and greater, when you die you will become a shade - a ghostly specter forced to roam the world until a Power takes pity on you and reincarnates you. Luckily, the Powers are pretty predictable about when they will get around to restoring you (after they feel you've learned your lesson), and by utilizing the SCORE command, you will be able to see how much time you have remaining as a shade. Copyright © 2019 Materia Magica LLC. All Rights Reserved.